This page is called "Who Done It?" because the decorator of these rail cars is unknown. They are included in the Frank's Roundhouse pages because they have the same body mold, chassis and trucks. However, it was reported that Frank's Roundhouse did not paint or decorate them. Additional information regarding the decorators of these cars is requested. Neuman Wholesale Drug NDRX 175 boxcar. 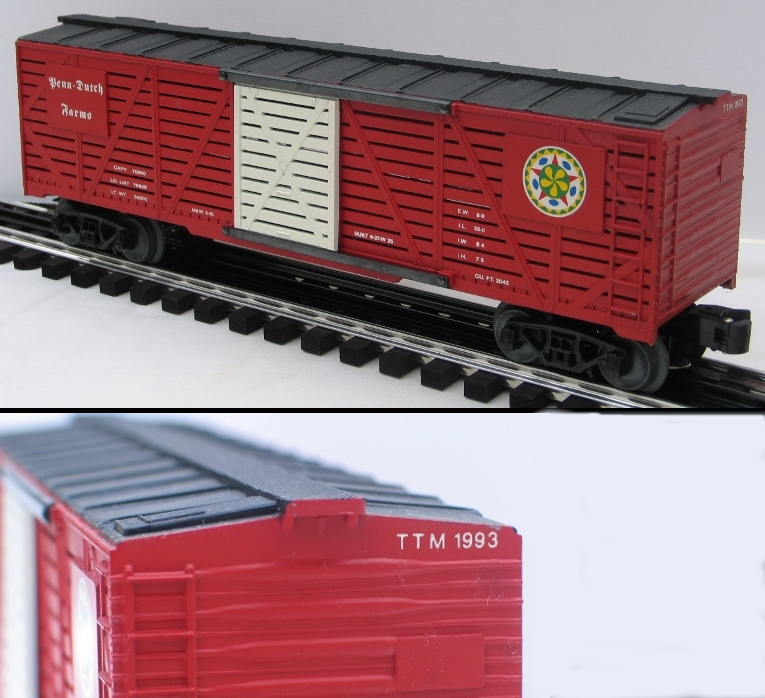 According to a former Neuman senior manager, these boxcars were developed as a promotion to manufacturers who sold to Neuman. Pictured above is a blank car. 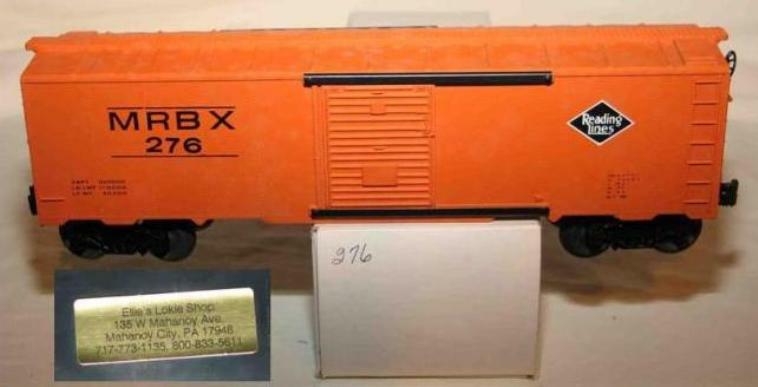 A finished car would have the manufacturer's logo applied and be added to a train set that operated in the lobby of Neuman's headquarters in New Jersey. At the time, Neuman Distributors was the largest privately owned pharmaceutical wholesaler in the United States. They closed in 2000. The boxcar has a built date of 8-93. It came in a white box with "Neuman Whol Drug" penciled on the end. 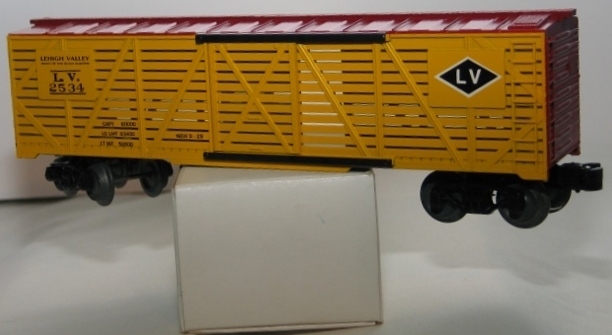 Pennsylvania Railroad Cove Lions Club refrigerator car. The car is dated 1993 and has ice hatches on the roof. The Cove Lions Club was located in Loysburg, PA. Photo courtesy of the B. Trappen collection. 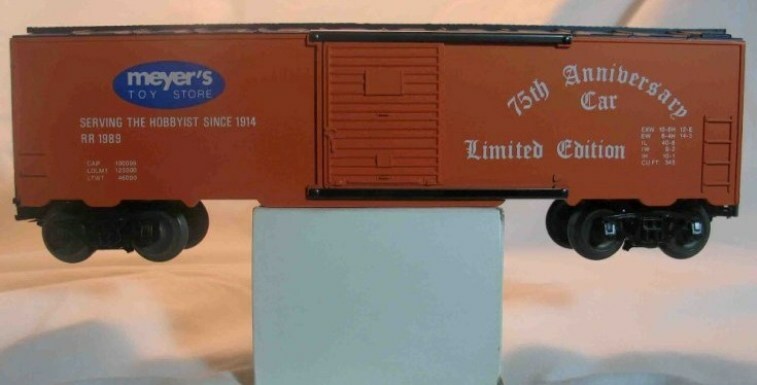 Meyer's Toy Store 75th Anniversary Limited Edition boxcar. "Serving the hobbyist since 1914," the car is dated 1989. The roof and ends of the boxcar are Navy blue. Meyer's store is located in Livingston, NJ. Photo courtesy of the B. Fetterman collection. 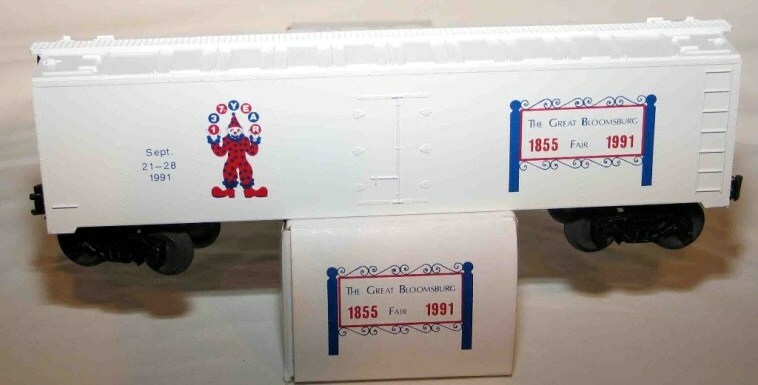 The Great Bloomsburg, PA Fair refrigerator car 1855 - 1991, commemorated the 137th year. That year, the fair took place from September 21 - 28, 1991. Photo courtesy of the B. Fetterman collection. Blue Mountain Middle School in Orwigsburg, PA 1992 boxcar. The gold plate on the car underframe indicated that the school was a National Drug-Free School Award Winner in 1992. The serial number on the plate is 82. Photo courtesy of the B. Fetterman collection. Reading Lines MRBX 276 boxcar. An adhesive sticker for Ellie's Lokie Shop of Mahanoy City, PA was affixed to the underframe. Photo courtesy of the B. Fetterman collection. Delaware, Lackawanna & Western 1150 refrigerator car. 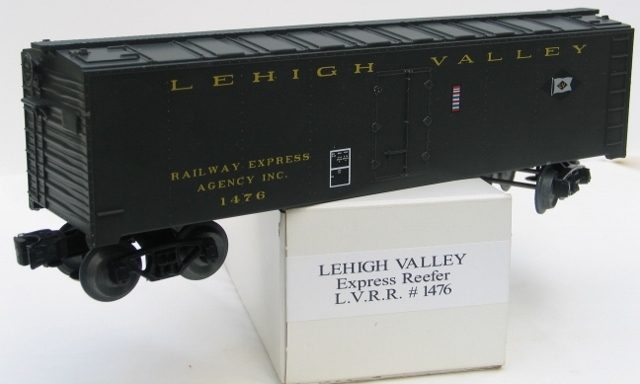 Lehigh Valley 1476 refrigerator car. Photo courtesy of the B. Fetterman collection. Lehigh Valley 2534 stock car. Photo courtesy of the B. Fetterman collection. Penn-Dutch Farms stock car. The reporting marks on the car end indicate it was decorated for the Toy Train Museum in 1993. Photo courtesy of the B. Fetterman collection. Louisiana & Arkansas Route of the Southern Belle stock car. Appears to have been redecorated from the Penn-Dutch Farms car above, as the reporting marks on the car end are the same. Photo courtesy of the M. Spanier collection. Shippensburg University Red Raiders refrigerator car.